With the holiday season rapidly approaching, Xbox needed a compelling way to showcase their impressive library of Xbox One games. What started as an ask for a simple poster, turned into an interactive online experience showcasing the entire Xbox One library along with all the stats and fun facts that gamers love. 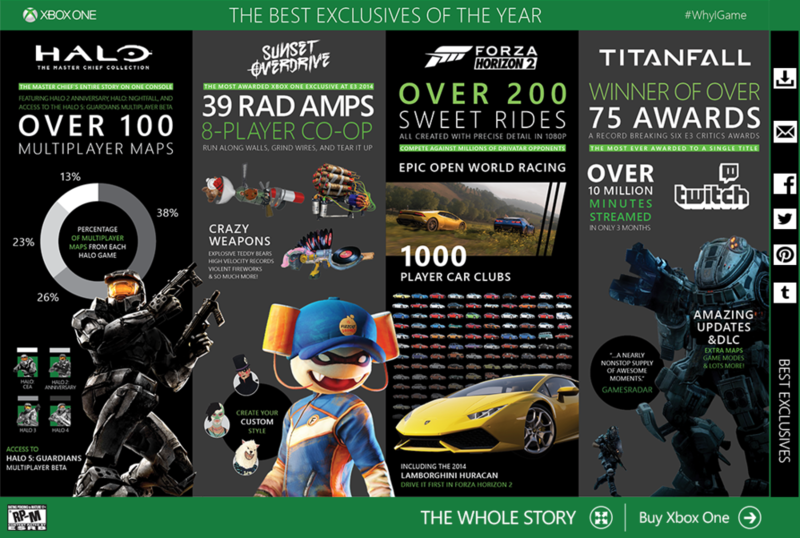 The experience first highlighted Xbox One’s exclusive titles that year, followed by the biggest blockbusters, and finished off by showcasing the entire game library in all of its glory. Every game box was actually a link to the game’s respective page on Xbox.com where viewers could learn more about the game and purchase it. When the experience went live on Xbox.com it was an absolute hit within the community. It was featured on the front page of Reddit.com and shared across a wide variety of social media channels, driving sales of both the games it depicted as well as the console itself.